First off, its a huge relief that this book is finally out. Its almost a year since I placed my order at Amazon. Its good to have the first ever Phantom hardbound. It is a Huge book, similar to the format most reprints these days come in. Great to get started on the complete collection of Phantom. For those who grew with the stories as a kid, Phantom is a truely remarkable character. The stories, the settings, the action, the adventure, the travels, the dangers, the fun, the romance.. It had everything. The Jungle settings, the caves, the chronicle chamber, the treasure chamber, the island of Eden, the continuum of Phantoms, it is a wonderful set of tales spun by Lee Falk. 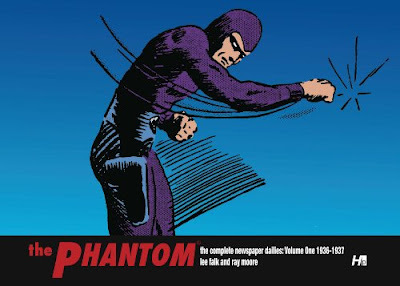 The Phantom evolved over the decades, the character as well as physical appearance, due to the fact that it was drawn by different artists over this wast span of time. Each artist was unique, had his unique recipe for bringing Lee Falk's tales to life. Ray Moore, Wilson McCoy and Sy Barry among the most prolific Phatom illustrators. The story as well as the settings, and art work evolved and improved vastly year over year, this is easily noted even within an artist's span, one can see Ray's artwork remarkably improve over time. There has been reprints of the Phantom in book format from various publishers. Noted among them is the Australian Frew. They have been consistently producing Phantom for decades. Then there was Pacific Comics Club, who came up with great editions of the reprints. Also there used to be a large number of stories that were printed in India known as Indarjal Comics. Mostly these were one story per book. There are the Frew Annuals, humongous books with tons of stories. very well printed. The version under review is probably one of the best yet. Excellent paper, nicely hardbound, very well printed collector's edition class, and promising to collect all the stories. It is important to note that these are dailies, and are the earliest of the strip. Also, newspaper comic strips were just evolving then. There was a fixed format and a necessity to hold some suspense every single day, and there was a panel daily. All this meant the artist would be at work on a rigid timeframe. Compared to that the Sundays were more carefully rendered and of course the color would enhance the quality. Given that, the printing of the first stories have come out very well in this edition. As the stories progress, and the art matures, it is only going to get better. Looking forward to more art work of Moore, McCoy and of course Barry.